Hi there! Oh my, I've been back to my usual drama addict self, that's why I went on another hiatus. I miss my Asian + Korean drama marathons, it's been a while. Besides I need inspiration (haha! ), so for two days (and a night) I watched Mike He. Just in case, he's a Taiwanese Actor most known for Devil Beside You (google him for more ;-D) I re-watched some parts of Sunny Happiness, and then his most recent drama (at least in his MySoju profile), Love Keeps Going. February 2012 is a big deal for a Korean fangirl like yourself truly, because it's Lee Jun Ki (Joon Gi)'s discharge from the military services, I'm eagerly awaiting for his comeback drama. Although, nothing fancies me yet on the current Korean dramas lineups (surprise, surprise), so I went for Chi-Dramas, and a choice between Mike He or Va Ness. Mike He wins! ;-D I just have to say, he's mighty looking handsome a la Lee Min Ho-esque in City Hunter, with his updated hairdo in this drama. I don't want to spoil the fun, suffice it to say that I super love this drama, meaning I'm up for re-runs. I wish there were more than 13 episodes because I want more Mike He (haha! ), although an episode is longer than the usual drama episode. I watched it online. 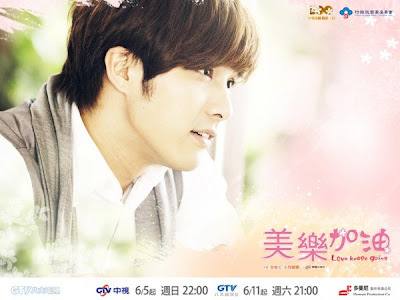 Episode 1 in goes for 7 parts in Viki.com. I watched the first part via Viki, the comments are just hilarious, although could be a bit distracting if you also read through them while reading the subs, and the it takes a while to load, so I went to dramacrazy.net.